One of the more popular SUVs on the market these days is the Toyota 4Runner. The 4Runner combines Toyota’s signature reliability with the size and capabilities of the popular SUV type of vehicle. The Toyota 4Runner has come a long way since it’s inception in 1984 and was key in Toyota’s transition from a primarily small car and truck maker into a automobile manufacturer of vehicles of all sizes. The continued improvements and redesigning have elevated the Toyota 4Runner to be one of the more sought after SUVs on the market today. When Toyota first released the 1984 4Runner onto the market, it was essentially a Toyota pick-up with a fiberglass shell over what was once the truck bed. Toyota was spurred to get into the mid-size SUV market based on both the success and upcoming releases of competitor’s models like Chevy’s S-10 Blazer and Ford’s Bronco II. Although designed to compete against these other mid-size SUVs, the original 4Runner more closely resembled the full-size Ford Bronco and Chevy K5 Blazer because of its removable fiberglass top over the rear section of the vehicle. From the dashboard to the front bumper there was little or no difference between these first 4Runners and the Toyota pickups of the same year. In 1985, Toyota made rear seats available in all 4Runners, not just the upscale SR5 package as had been the case in the original 1984 version. Another addition coming in the model’s second year was a new electronically fuel-injected 2.4 liter engine. The overall stability and handling was improved on the 4Runner in 1986 when Toyota widened the wheel base by a few inches and added an independent front suspension system. An interesting thing to note on the 4Runners imported to the United States from 1984 through 1986 is that most came without the rear seats. In this way they were classified as trucks and avoided the higher custom duties associated with larger passenger vehicles. The last significant change to these first generation Toyota 4Runners came in 1988 when Toyota also offered an optional 3.0 liter V-6 engine. This more powerful engine proved very popular with motorists and Toyota rewarded buyers with other features exclusive to the V-6 models like a whole new transmission and transfer case which resulted in a significant reduction in cab noise from the previously made 4-cylinder models. 1990 saw Toyota make vast changes to its signature SUV. All 4Runners made from 1990 on were no longer built on the same frame or platform as the company’s pickup trucks. The 4Runner now had its own body designed and mounted on its own frame. Because it was no longer built on the basis of the Toyota Pickup, this was also the end of the removable fiberglass shell as all 4Runners from there on out were built as a whole unit. One of the carry over design elements from the first generation models was a tailgate that still had a retractable rear window. To open the tailgate, the driver still had to first retract the window into it and then lowering it similar to the tailgate of a pickup. There were changes made during the life of the second generation Toyota 4Runner, but most amounted to little more than cosmetic changes like headlamp redesign. While the look of the Toyota 4Runner third generation models remained similar to the second generation, there were enough interior and otherwise upgrades that the 4Runner was now seen as a competitor to the higher end Nissan Pathfinder, and a step above the Ford Explorer and Chevrolet Blazer. The engines available for the third generation 4Runner were the same engines being made for the new Toyota Tacoma pickup trucks that were hitting the market. Both the 4-cylinder and V-6 engines were enlarged, the 4-cylinder from 2.4 liter to 2.7 liter and the V-6 from 3.0 liter to 3.4 liter, with the newer more powerful engines becoming very popular with SUV buyers. 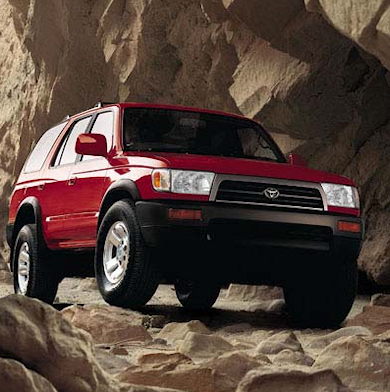 Many cosmetic and interior upgrades and changes would be included in the 1997-1999 model Toyota 4Runner. These included color matched cargo covers, updated switches and knobs, a new steering wheel, a redesigned air bag system, new bumper design, turn signals, color matched running boards, and reorganization of the controls for the vehicle’s rear window related features. Other changes during this model’s production resulted in both increased interior space and cargo space. The fourth generation of Toyota 4Runner changed significantly, although it continued to be marketed towards the same high end/sub-luxury SUV market. The vehicle was now being based on the Land Cruiser Prado which resulted in a very different look than that of previous 4Runner models. The engine upgrade to the 4.0 liter V-6 was now standard on all models and for the first time the 4Runner came with the option of upgrading to a powerful V-8 engine. The V-8 engine available for the 4Runner is essentially the same V-8 available for the full size Toyota Tundra and Sequoia models. 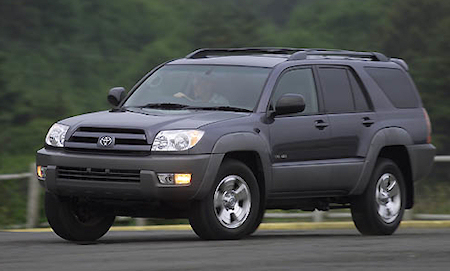 2004 saw a tire pressure warning system added as one of the many standard features on the 4Runner while an option for a third row seat was also introduced. With the introduction of the 2005 model came a new transmission as now a five speed automatic transmission was now considered standard equipment. Many cosmetic and add-on features also became available in the following few years like roof racks, chrome grilles, black running boards, a rear spoiler that had been redesigned, LED tail lamps, projector-beam headlamps, fog lights, a seat memory system, new bumper design, MP3 capable stereo systems, as well as both sixteen and eighteen inch wheels. With its constant redesign and a commitment to putting a quality SUV product on the road, the Toyota 4Runner doesn’t only look like one of the more popular SUVs today, but it looks like it will remain so for a number of years. The vehicle that is now considered a borderline luxury SUV has come a long ways from the days that it was a pickup truck with a fiberglass shell. The continual adding of popular features and redesign of the overall vehicles has kept up with the public’s demand for a quality modern vehicle that can also hold a good amount of cargo, whether that cargo is in the form of other passengers or in the form of goods and products. The Toyota 4Runner is one of the most sought after SUVs on the market for good reason, it not only meets the expectations of those looking for an SUV, but it exceeds them.